Charlie Brown's on ABC and Rudolph again gets the call on CBS. Slushy Barky urges you to check this list, check it twice when in search of traditional and/or notable broadcast network Christmas specials. They'll be coming at you soon. All times listed are central. 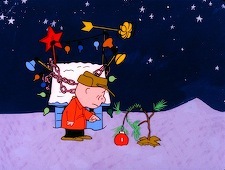 Nov. 27 -- A Charlie Brown Christmas, 7 p.m. on ABC. Repeated at the same time on Dec. 3rd. Nov. 28 -- Shrek the Halls, 7 p.m. on ABC. Repeated at the same time on Dec. 11th. Also on ABC: Dr. Seuss' How the Grinch Stole Christmas at 7:30 p.m.
Dec. 1 -- The Radio City Christmas Spectacular, 7 p.m. on NBC. 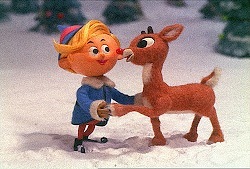 Dec. 4 -- Rudolph the Red-Nosed Reindeer, 7 p.m. on CBS. Also appearing: Santa Claus Is Comin' to Town, 7 p.m. on ABC. Dec. 7 -- Frosty the Snowman and Frosty Returns, 7 p.m. on CBS. Dec. 10 -- I Want a Dog for Christmas, Charlie Brown, 7 p.m. on ABC. Dec. 11 -- Winnie the Pooh and Christmas Too!, 7:30 p.m. on ABC. Dec. 13 -- 30 Rock's LudaChristmas Party (with guests Elaine Stritch, Andy Richter, Buck Henry, Anita Gillette), 7:30 p.m. on NBC. Dec. 14 -- It's A Wonderful Life, 7 p.m. on NBC. Repeated at the same time on Christmas Eve. Dec. 21 -- 9th Annual A Home for the Holidays, with Sheryl Crow, 7 p.m. on CBS. Dec. 23 -- Elmo's Christmas Countdown, 6 p.m. on ABC. Dec. 25 -- Walt Disney World Christmas Day Parade, 9 a.m. on ABC.